Click on the photo to view at a larger size. Each photo has a week-ending date. Click on the Full Report link (in blue) to read ALL the details. Let's have some fun with these 2007 photos! Send me an e-mail and vote for your favorite one. I will let you know by the end of January 2008 which photo gets the most votes. August 3, 2008. Nelson Furtado with a 55-pound "plus" Chinook (King) Salmon landed on the Skeena River. Young fellow Josh Buck netted the fish for him. December 21, 2008. The photo of the week shows my friend Rick Wallace with a huge bright Steelhead he landed on the Skeena River is August a few years back. Let's have some fun with the above 2008 photos! Send me an e-mail to vote for your favorite one. I will let you know by the end of January 2009 which photo receives the most votes. February 15, 2009. The Photo of the Week shows an extremely bright Kitimat River Chinook (King) Salmon landed by Lucas Arruda. The photo was kindly sent to me from Mike Herzberg. Mike is an associate guide for Reliable Guide and Charters. May 24, 2009. The photo of the week shows Brian Fugere holding a beautiful Kalum River Chinook (King) Salmon landed by young Jeremy Soares. Photo by Brody Soares. October 18, 2009. Brandon Wakita with a late season male Coho (Silver) Salmon landed and released in the Kalum River. Video Clip! October 25, 2009. 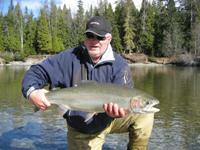 Ron Wakita with a very bright chrome Kalum River "wild" Steelhead landed Saturday, Oct. 24th. Video Clip! November 29, 2009. Ron Wakita with a Kitimat ocean feeder "Winter Spring" landed in the Kitimat Harbour on Friday, November 27, 2009. The Chinook weighed 24-pounds. Let's have some fun with the above 2009 photos! 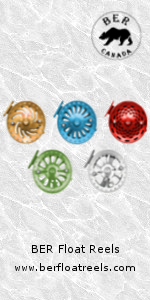 Send me an e-mail to vote for your favorite one. I will let you know by the end of January 2010 which photo receives the most votes. Don't forget to enter the contest for a chance to win a FREE drift boat fishing trip for three. March 7, 2010. 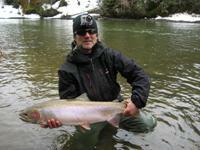 "Splash" Gord McKean, pro fishing guide for with a nice wild Steelhead landed on a "secret" river this spring. May 9, 2010. Alex Hall from Colorado with a beautiful Steelhead landed this spring. Alex was spey fly fishing with a Sage rod and reel. His choice of line was the Skagit 550. October 17, 2010. Hi Noel, these boys are from England, left to right is Brian, David and Rod. 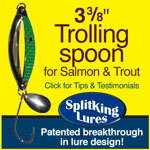 The rod used is a 13 foot 6 inch spey rod, with Hardy Angel reel, Skagit head fly line and string leach fly. December 19, 2010. Current Winter Cutthroat. I would like to wish one and all a very happy, healthy and prosperous New Year in 2011. 2011 fishing reports start on the right. Prime dates for next year - Booking Up !! August 14, 2011. Hi Noel, our latest group of fisherman are having a super week. We have fished the Skeena and Kitimat the past couple of days. Our guests have landed Steelhead, Sockeye, Coho, Pinks and Chum salmon as well as Dolly Varden. This is a fantastic time for a lot of different fish. I have included some photos of Steelhead caught today on the Skeena as well as Chum from the Kitimat yesterday. Regards, Andrew Rushton of Kalum River Lodge. Mike poses this fresh male Chum. BTW the Chum run in the Kitimat River is very good this year! Yahoo!!!! August 21, 2011. This beautiful bright Coho (Silver) Salmon was landed on the Kitimat River this season. These fish really like to chase a fly if presented properly, and I must say the fishing guides really know how to teach this technique. The gentlemen who caught this fish was guest of Tracey Hittel of Kitimat Lodge. September 4, 2011. Hi Noel, for Troy Adams and Marcus Ervin of Santa Cruz CA it was their 6th year fishing with Kalum River Lodge. They had a great two weeks on the Skeena with Thomas from Germany who joins them every year. The fly fishermen had some superb silver Steelhead, large Coho, Sockeye and Pinks - here are just a few photos of their catches. They are returning next year - same time, same place!! September 11, 2011. 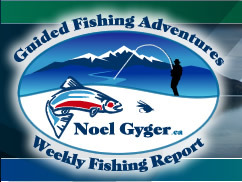 Hi Noel, fishing for us has been going well despite the high water conditions and our anglers have caught good fish most days. Howard Steiss and his son Hogan from BC were fishing with us for a few days and they both caught their first Steelhead. Hogan was pretty pleased when he landed one that was bigger than his Dad's!! Please contact Noel if you wish to book. September 18, 2011. 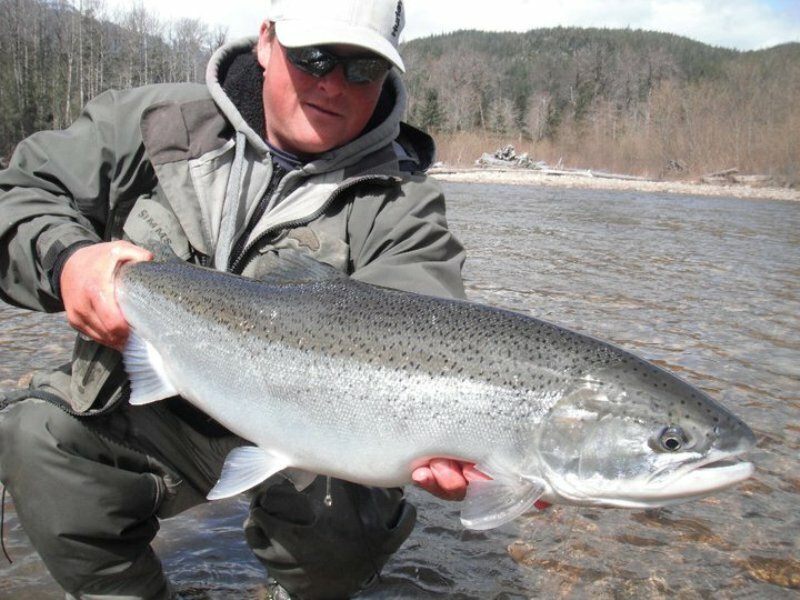 Hi Noel, I thought you and your readers may like to see this photo of a Skeena River Coho (Silver) Salmon. The angler is Germano Bana. He is president of E.U.F.F. (European Union of Fly Fishers). Our group really enjoyed fishing your beautiful waters. Best wishes, Carla Paderni from Italy. September 25, 2011. Hi Noel, I thought your readers would like to see this photo of a Zymoetz (Copper) River Steelhead I caught a few days ago. This may be the largest Steelhead I have ever landed. It was quite the "tug-of-war", my small Gami hook and split rings were stressed to the max. Your favourite son-in-law, Dennis Therrien. October 23, 2011. Huge northern Coho (Silver) Salmon landed with a spey fly rod. I would like to thank Darren Bisson for this beautiful photo. 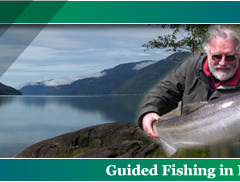 Darren is an AAG (Assistant Angling Guide) for Tracey Hittel of Kitimat Lodge The angler is one of Darren's clients. October 30, 2011. Here is a fresh Coho (Silver) Salmon landed on the Kitimat River this fall. The lucky angler is Liz. Liz was fishing with pro angling guide Mike Herzberg. Mike is an AAG (Assistant Angling Guide) for Ron Wakita of Reliable Guide and Charters. November 6, 2011. Hi Noel, Thank you again for all your help with our trip this fall. As you know, we had driven down to Idaho this fall for the first time to fish Steelhead with the rivers in Terrace and Smithers being high. 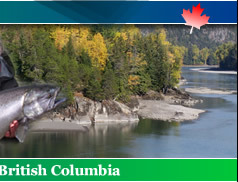 The experience fishing the rivers down there just did not compare to Skeena Country. When we got word from you on Monday October 3rd that the rivers in Terrace were coming down in height, we hopped in our truck and drove 1800km to spend the remaining 5 days of fishing around Terrace and Smithers. We had an amazing trip and hooked several Steelhead and a few Coho. 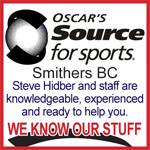 Really appreciate your help and tremendous knowledge of the area! As requested I have attached a few photos. 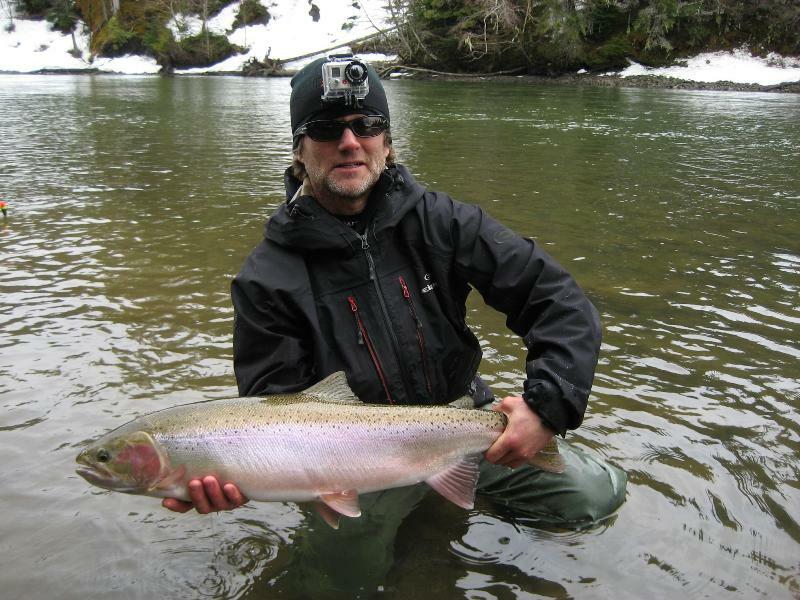 Thank you, Dave Brown Pic is Dave with a Bulkley River Steelhead. November 13, 2011. Here is a photo of a wild Skeena River doe (female) Steelhead landed and gently released by a client of pro fishing guide Darren Bisson this fall. Darren is an AAG (Assistant Angling Guide) for Tracey Hittel of Kitimat Lodge. I would like to thank Darren for permission to post. November 20, 2011. Here is a photo of a Coho (Silver) Salmon landed and gently released by a client of pro fishing guide Ariel Kuppers this fall. Arial is an AAG (Assistant Angling Guide) for Tracey Hittel of Kitimat Lodge. November 27, 2011. 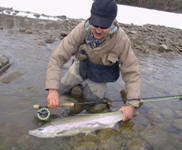 Season Review: Here is a photo of a fly caught Coho (Silver) Salmon landed and released by Carla Paderni of Italy. Carla says she and her friends really enjoy fishing our rivers. Note from Carla: Thanks Noel, a nice surprise for Christmas! Remember with great pleasure your rivers, but in August of 2012 we will be from you again! December 4, 2011. Winter Steelheading is in full swing. Please be aware these Steelhead are in the river all winter and should be treated with extreme care when caught and released. December 25, 2011. Something other than another fishing photo. This is one of the Kalum Rivers in late fall, one of my favourite rivers ever. Great winter Steelheading to be had right now. We used to drift it all winter when I had the Kalum Drifting Club (See podcast) running. Guiding in the spring will start on April 1st. Contact me anytime for info and to book if you wish. Note: podcast takes awhile to load. January 8, 2012. A friend checking the LIVE Fishing Report on his smart phone. January 15, 2012. This is the Zymoetz (Copper) River in the dead of winter. Rather beautiful, I think. Prime dates for this year - Booking Up !! January 22, 2012. Tracey Hittel with a beautiful winter Steelhead. Tracey is the owner of the Kitimat Lodge. Obviously, Tracey is enjoying the opportunity to fish for himself in the off-season before guiding starts again in April. March 11, 2012. My son-in-law Dennis Therrien with a huge Kalum River Steelhead landed this winter. Prime dates for this year - Booking Up !